Thanksgiving is coming up and as you scramble to prepare the best menu of recent years, you need to consider the power of an appetizer. They are a fun and creative way to excite those taste buds and enhance the turkey before it makes its grand entrance on that gorgeous table. Plus, you can easily choose dishes to complement your usual holiday menu and indulge in flavors of the season. But between all the meal planning, side dishes, holiday décor and centerpieces, we know you want to give your guests the best — and of course, we’ve got you covered. 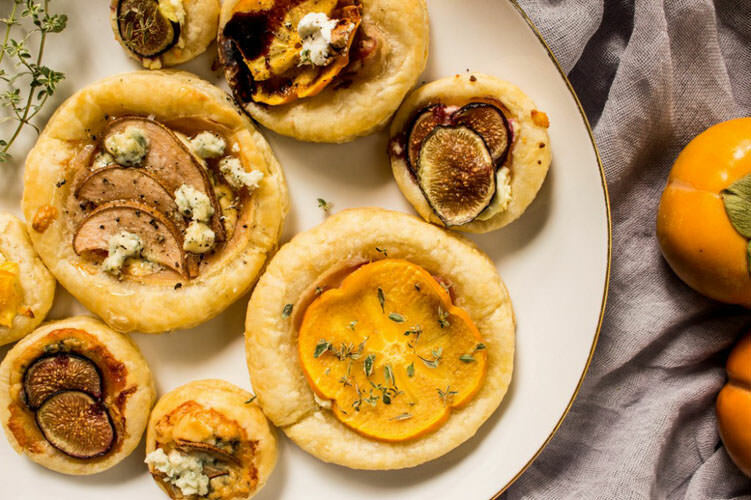 From seasonal flavors to winter favorites, to finger foods and warm bowls, we share our picks for easy appetizers that are so delicious, no one will really notice if you’re running a tad late this year. Combining fresh seasonal fruit that’s both visually pleasing and delicious, this simple puff pastry is a classy appetizer for your Thanksgiving party. And best of all — it only takes 15 minutes to make. Not only is this appetizer super easy to make, but it’s incredibly gorgeous and Instagram-worthy with its holiday colors and flavors. The pop of basil mixed with the sweet pomegranate seeds and tart cranberries make this a delectable combination. Don’t say goodbye to pumpkin just yet this season. Blending the flavors of fall with the comfort of a quinoa risotto, this recipe is pretty much foolproof with pumpkin puree, sautéed mushrooms, and fresh sage. 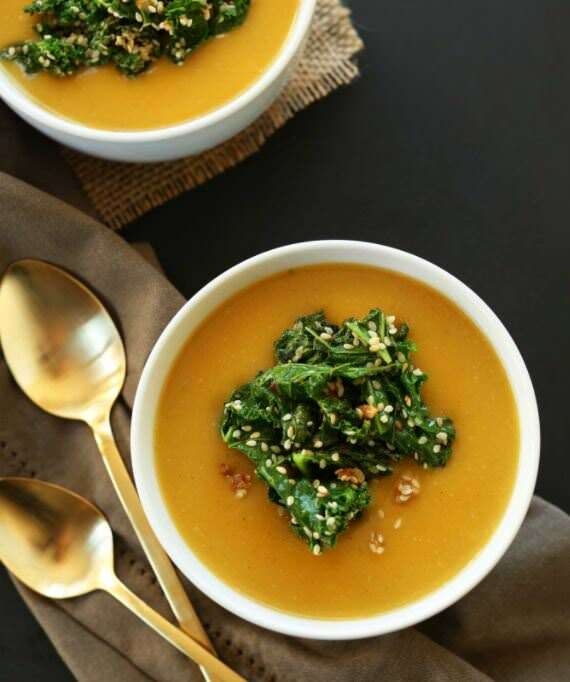 Hearty and oh-so creamy, this smooth pumpkin soup would look so lovely on your holiday table — especially with its easy to make, and mouthwatering kale sesame topping. Chocolate appetizers, prepared in under an hour? Yes, please. These figs dipped in dark cocoa creatively combine crushed pistachios and Gorgonzola cheese for a complementary blend of flavors, textures and colors. Fancy up your Thanksgiving menu with this smoked salmon spread infused with lemon and dill. With a flavor that’s both mild and complex, it’s really elegant to serve as an appetizer for dinner and super simple to construct. This Thanksgiving appetizer of easy-to-make spinach balls is both vegan and kid-friendly, and the best finger food for your party. If you’re feeling fancy, make a dipping sauce of plain yogurt with a thick hot sauce of your choice. 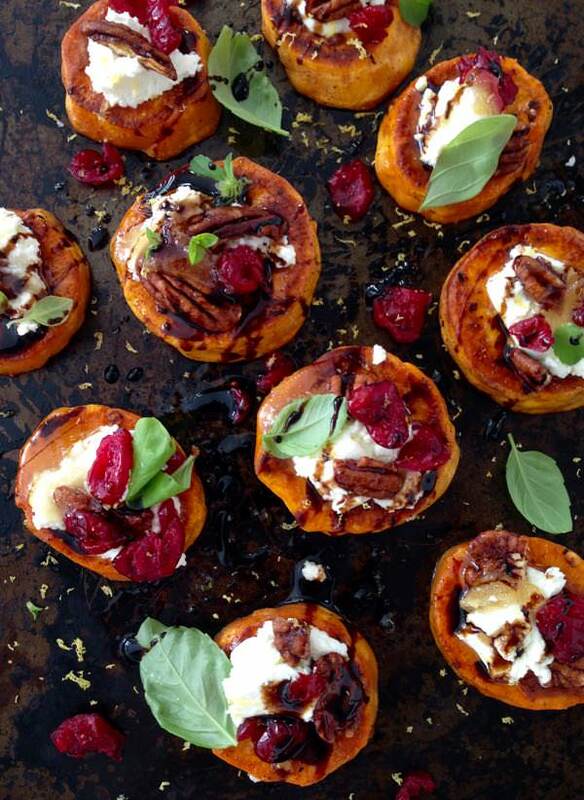 These sweet potato rounds topped with goat cheese, cranberries, and a blood orange infused olive oil add a delicious dose of festive flavors for a beautiful and vibrant addition to your Thanksgiving table. Easy to make and fun to throw together with a cheese board, this light, flaky tart is made of three ingredients and takes less than half an hour to bake. And of course, the flavor combinations are endless as you can easily adapt it to whatever is during the season. Between those moments of meal preparation or munching on something healthy during the football game, these spiced mixed nuts infuse the flavors of brown sugar, rosemary, and cayenne pepper for a harmonious treat with notes of caramel and grassy wood.